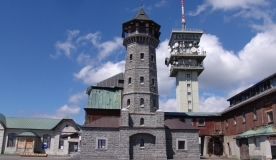 Božídarský Špičák with its 1115 meters dominates the National Nature Reserve Božídarské rašeliniště (Boží Dar Peat Bog). Špičák is the highest basalt mound of volcanic origin in Central Europe. Its history dates back to the Tertiary period, when there were outpourings of basalt over Archeozoic and Palaeozoic slates. Nature trail Božídarské rašeliniště (Boží Dar Peat Bog) and several cycling paths lead in the surroundings of Špičák. The Špičák mountain is situated on the plateau of the Ore Mountains, northeast from Boží Dar Peat Bog, about 4 km far from Boží Dar. The surrounding of this basalt hill is formed by vast, mostly spruce forests, which are ideal for hiking.